New-home construction in the U.S. fell in July, while the number of building permits jumped to the highest level in four years, indicating the industry will keep improving in the second half of the year. Starts fell 1.1 percent to a 746,000 annual rate from June’s 754,000 pace says the Commerce Department. Building permits, a proxy for future construction, rose to an 812,000 pace, the most since August 2008. Construction of single-family houses fell 6.5 percent to a 502,000 rate, the first decline since February. 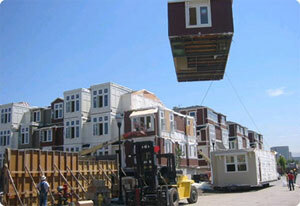 The modular housing segment usually accounts for 3% of that total and represents 15,000 homes. We still have a long way to go folks! Can you imagine the number of factory jobs that would be created if we got that number to 10%! Work on multifamily homes, such as townhouses and apartment buildings, rose 12 percent to an annual rate of 244,000, a five- month high. 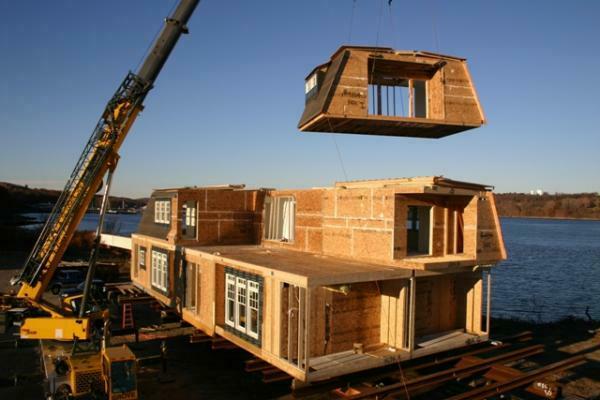 This is one area that modular construction seems to be taking hold. I'm hearing developers are now requesting quotes from modular factories in addition to their normal site built contractors. Three of four regions showed a decline, led by a 5.3 percent decrease in the West. That region also showed the biggest jump in permits, climbing 14 percent in July, taking them to the highest level since June 2008. Building applications in the West soared 54 percent over the past 12 months, the biggest year-to-year jump since December 1986. I know you utilize multiple sources and are just posting the latest news on the market but have you ever read through a month of your posts? The market's rebounding - permits are in decline - buyer confidence is up - buyer confidence is at a new low. Have you considered using a singular source for this? Your posts about consumer confidence and market strengthening are meaningless because they are juxtaposed to each other so often. Its not you - its your varied sources. Remember, its an election year. Spin is everywhere. Housing permits might be climbing when compared to last week and confidence might have dropped from a year ago - but the motivation behind the source is driving the numbers being published and the are shown in contrast to whatever makes them work for their source. I look forward to your "Consumer Confidence at a 6 Month Low" article in December. As a PS - historically 4th quarter permits are typically low compared to the rest of the year in everything. Consumers purchase less between Nov and Dec (on housing) and the Government's fiscal year ends in September so they don't have to "rush to spend it or lose it" and will sit back and enjoy the holidays without creating more work for themselves. I don't mean to b*tch but you seem to throw every headline, pro or con, about the return of the housing market at your blog. I appreciate the drive for hope but take a step back and consider your source's forecasts in light of the other sources' forecast last week. PPS - Tim Watson and Affinity are the last hope of turning an aging industry into the new era. Good luck fellas.